The National Jewish Outreach Program tonight announced the recipients of the first “Jewish Treats: Jewish Influencer Awards” during the organization’s 18th annual dinner. I am completely honored to be named among them, and am humbled by the excellent company on the list (more on that below). The announcement was listed as part of Social Media Week (SMW12) which kicked off earlier in the day. Finalists were selected by an expert panel of judges and evaluated based on creative and strategic use of social media to positively impact the Jewish community. “We launched @JewishTweets in March 2008 and from the outset, embraced it for the way it allows us to connect with people everywhere. It has allowed us not only to be heard, but to listen and be inspired by others every day,” said Ephraim Z. Buchwald, founder and director of the National Jewish Outreach Program. “In particular, we wanted to take time to recognize some of those who are leveraging the power of social media to raise Jewish social consciousness and shine a positive light on Jewish life." I appreciate that this list includes so many different types of people — entrepreneurs, community organizers, educators, consultants, institutional folk and very non-institutional folk. Just goes to show you that there’s no right or wrong way to tweet – just be yourself, help others, add value, and have fun. And as Allison Fine says, "social media a contact sport, not a spectator sport." So get in the game. Rabbi Yonah Bookstein @RabbiYonah Rabbi Yonah Bookstein is the executive rabbi for JConnectLA, which hosts events to help young Jews “connect to something bigger”. A popular blogger, Bookstein’s writings regularly appear in The Huffington Post, Jewlicious and LA’s JewishJournal.com. He also maintains the Facebook presence for both JConnectLA and the Jewlicious Festival, a popular youth event. Lisa Colton: @LisaColton and @DarimOnline Lisa Colton is the founder of Darim Online, a nonprofit dedicated to helping Jewish organizations and leaders effectively leverage social media to achieve their goals, including community building, education, communication and fundraising. In the past year, Colton has presented at conferences throughout the United States, and has hosted social media webinars online. William Daroff: @Daroff William Daroff is the vice president for public policy and director of the Washington Office for the Jewish Federations of North America. To the Jewish online community he is @Daroff, a prolific Tweeter who offers great insights into happenings in the American Jewish community. In 2011, Daroff co-chaired the social media committee for Prime Minister Netanyahu’s Global Coalition for Israel. Chaviva Galatz: @TheChaviva Galatz is a popular blogger, Tweeter and social media personality. She created and co-chaired the only Jewish-themed panel at the 2011 SxSW Interactive Festival in Austin, TX, entitled Jewish Synergy: Social Media and the New Community. She was named to The New York Jewish Week’s prestigious “36 Under 36” list where she was credited for “Connecting with Jews, one Tweet at a time”. Allison Josephs: @JewInTheCity Josephs is the woman behind “Jew in the City,” a popular website and video blog that helps promote a positive perception of Orthodox Judaism to non-observant Jews and non-Jews alike. In the past year, she has been invited to speak at numerous events and was interviewed by NPR for her work. Esther Kustanowitz: @EstherK Known to the online community as EstherK, Kustanowitz is a respected blogger, Tweeter and nonprofit consultant. Esther has traveled the globe presenting at various conferences on topics like Jewish communal engagement, social media and innovation. She was recently named a "Jewish Engagement Superstar" by Jewcy. The Maccabeats: @Maccabeats The Maccabeats, the male acapella group from Yeshiva University, has captivated American Jews with its hugely viral music videos promoting Jewish holidays. Their video for the song “Candlelight” has more than 7 million views alone. In 2011, the group was invited to perform for President Barack Obama at the official White House Chanukah party. The Maccabeats recently helped raise more than $88,000 for Gift of Life through their Miracle Match campaign. Rabbi Jason Miller: @RabbiJason Miller is a popular blogger on a wide variety of Jewish topics including technology, pop culture, politics and Jewish law. He is published regularly in the New York Jewish Week, The Huffington Post and the Detroit Jewish News. Rabbi Miller’s video response to former presidential candidate Governor Rick Perry’s “Strong” commercial has nearly 220,000 views on YouTube and was written about in dozens of national and international publications. Dave Weinberg: @Weinberg81 A Jewish innovator who uses social media to rally people for causes he supports, Weinberg runs Causil, which offers nonprofit consulting, conferences such as the Future of Jewish Nonprofit Summit, aimed at educating the Jewish community on social media. Dave also was invited to lead the Social Media Boot Camp at the AJOP Convention earlier this year. Rabbi Josh Yuter: @JYuter Rabbi Josh Yuter is not only a pulpit rabbi. He’s a popular blogger, tweeter, and podcaster (his Jewish-themed podcasts were downloaded more than 20,000 times last year.) After he launched an impressive Facebook page and Twitterfeed for his synagogue, he was chosen by the Rabbinical Council of America to teach other rabbis about social media and “Using the Web to Teach Torah” at its 2011 Annual Convention. Crowdsourcing the Jewish Future: What’s Your Vision? 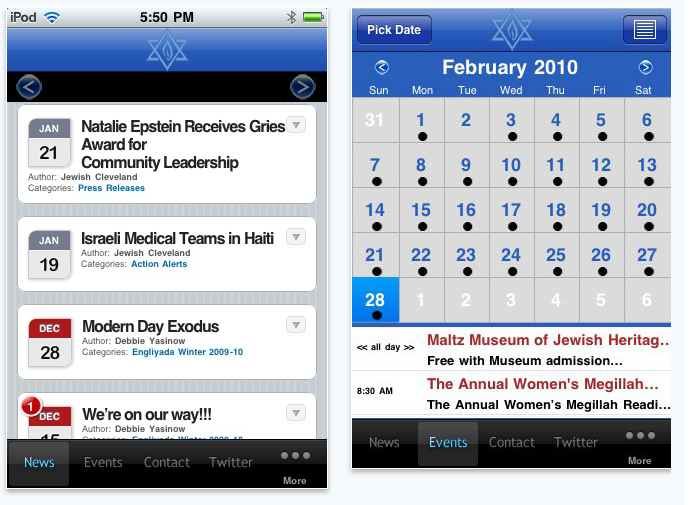 Posted on July 27, 2010 by Author Lisa Colton Leave a comment on Crowdsourcing the Jewish Future: What’s Your Vision? [crossposted from jlearn2.0] Passionate about Jewish learning? Have Big Ideas about what 21st Century Jewish learning might look like? Share your vision … and you just might win an all expense trip to the upcoming Jewish Futures Conference – not to mention a world-wide audience! As we move toward a world where learning happens anywhere and everywhere, authored by anyone, what could Jewish learning and life look like in the future? Those submitting the top three responses will be flown to New Orleans on November 7-8, 2010 (all expenses paid) to present their thinking at the Jewish Futures Conference. The Conference will be held on Monday, November 8, 2010 as part of the General Assembly of Jewish Federations of North America. High profile presenters, combined with up and coming innovators from the Jewish and general world, will each be given 10-18 minutes to describe their vision for the future of Jewish learning in the context of emerging new digital and social technologies. What are you waiting for? Come on over and check out submission and event details here now! What’s your vision? Share a preview in the comments below!